A paper published yesterday in Climate Dynamics illustrates just a few of the large unresolved problems in modeling clouds, the largest source of climate modelling uncertainty. 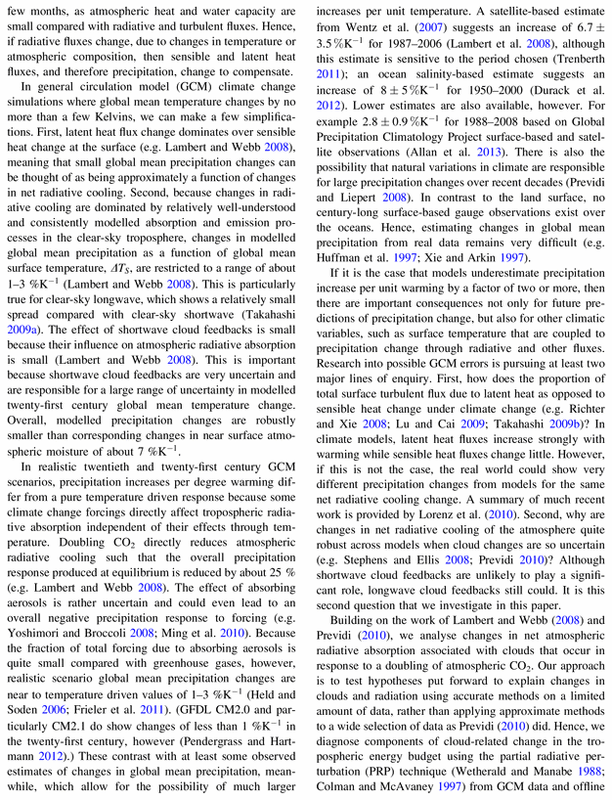 The authors attempted but were unable to reconcile cloud radiative effects with global precipitation and the atmospheric energy budget due to doubled CO2 concentration, unless the sign of cloud radiative effects is changed from positive [as falsely assumed by all IPCC models] to strongly negative. "because clouds are a large source of modelling uncertainty, we consider whether resolving errors in cloud simulation could reconcile modelled global mean precipitation trends of about 1–3 % K−1 with some estimates of observed trends of 7 % K−1 or more. This would require the radiative effect of clouds to change from one that increases atmospheric radiative absorption by about 0.5 Wm−2 K−1 to one that decreases it by −3.5 Wm−2 K−1 . Based on our results, this seems difficult to achieve within our current rationale for the tropics at least." In other words, the net radiative effect of increased clouds from warming & increased evaporation of water vapor would be to decrease IR radiative absorption & increase IR radiative cooling of the atmosphere, an anti-greenhouse effect. Thus, IPCC climate models don't have either the magnitude or even the sign of radiative forcing from clouds correct, one of several reasons why the models greatly exaggerate warming and have been falsified at confidence levels of 95-98%+. This study seeks to explain the effects of cloud on changes in atmospheric radiative absorption that largely balance changes in global mean precipitation under climate change. The partial radiative perturbations (PRPs) due to changes in cloud and due to the effects of the pre-existing climatological cloud distribution on non-cloud changes, known as “cloud masking”, are calculated when atmospheric CO2 concentration is doubled for the HadSM3 and MIROC models and for a large ensemble of parameter perturbed models based on HadSM3. Because the effect of cloud on changes in atmospheric shortwave absorption is almost negligible, longwave fluxes are analysed alone. We find that the net effects of cloud masking and cloud PRP on atmospheric absorption are both substantial. For the tropics, our results are reviewed in light of hypotheses put forward to explain cloud and radiative flux changes. 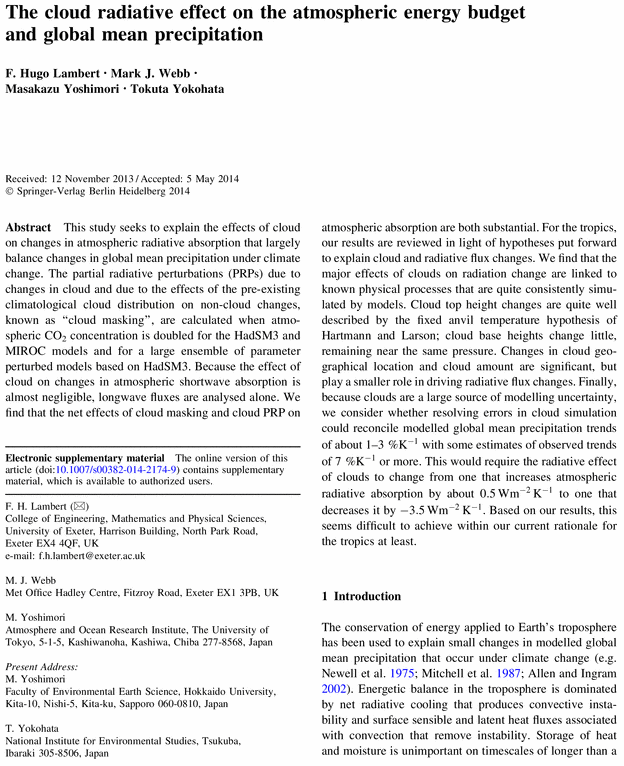 We find that the major effects of clouds on radiation change are linked to known physical processes that are quite consistently simulated by models. Cloud top height changes are quite well described by the fixed anvil temperature hypothesis of Hartmann and Larson; cloud base heights change little, remaining near the same pressure. Changes in cloud geographical location and cloud amount are significant, but play a smaller role in driving radiative flux changes. Finally, because clouds are a large source of modelling uncertainty, we consider whether resolving errors in cloud simulation could reconcile modelled global mean precipitation trends of about 1–3 % K−1 with some estimates of observed trends of 7 % K−1 or more. This would require the radiative effect of clouds to change from one that increases atmospheric radiative absorption by about 0.5Wm−2K−1 to one that decreases it by −3.5Wm−2K−1 . Based on our results, this seems difficult to achieve within our current rationale for the tropics at least. certainly isn't in this paper." it seems you have missunderstood the paper you are blogging about here.
" Finally, because clouds are a large source of modelling uncertainty, we consider whether resolving errors in cloud simulation could reconcile modelled global mean precipitation trends of about 1–3 % K−1 with some estimates of observed trends of 7 % K−1 or more. This would require the radiative effect of clouds to change from one that increases atmospheric radiative absorption by about 0.5Wm−2K−1 to one that decreases it by −3.5Wm−2K−1 . Based on our results, this seems difficult to achieve within our current rationale for the tropics at least." know there must be others watching from the fence who you will. certainly isn't in this paper. feedbacks as claimed by the website. try to correct our physical understanding would be very dubious. temperature, which is what the article is trying to claim. "I don't really get involved with climate sceptics, but I'm glad that somebody does it. Certainly, you won't convince them of anything"
All scientists should be skeptics. That's how scientific progress is made. Read Feynman, Einstein, Happer, etc. "Certainly you won't convince them of anything" is blatantly false and appears to be projection on the part of the author. Maybe if the author would debate directly with skeptics instead of arrogantly berating them and refusing to debate, maybe "both sides" could learn something. Many skeptics are scientists in other fields and just might have something to contribute. 2. I never stated this this paper claims to show negative cloud feedback. There are, however, many that do. 3. 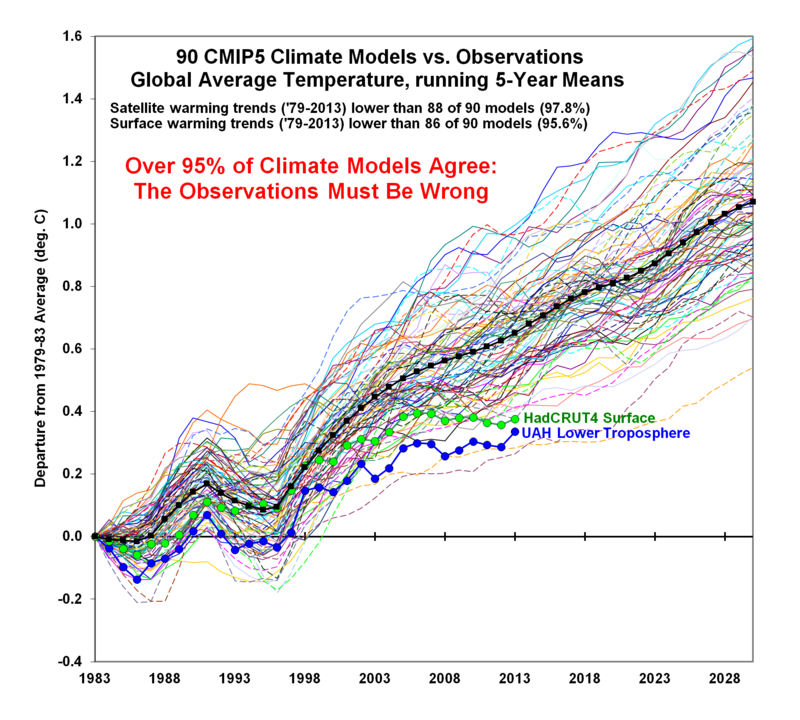 As is typical in climate science, if the models don't match the observations, the observations are blamed. This is the opposite of the scientific method, rife within climate science [but not in any other field of science], and this arrogant pseudo-science has led to models which greatly exaggerate warming. try to correct our physical understanding would be very dubious." Uh, no it wouldn't, the models make many dubious physical assumptions, including specific humidity will increase while relative humidity stays the same, which has been proven false by observations. If specific humidity goes up, relative humidity goes down to compensate. This affects cloud formation as well. This is only one of many, many false physical assumptions in the models. 5. "If modelled precipitation is substantially in error, then it's by no means necessarily the case that it's all down to clouds anyway." 6. "the cloud effect on surface radiation does not affect cloud feedbacks on temperature, which is what the article is trying to claim." Nonsense. If surface radiation affects temperature, it affects evaporation, which affects cloud formation, which in turn affects surface radiation. radiative cooling much, which was what we were interested in." This is another assumption of the models that may also be false as questioned by a number of papers.